kookytech.net - The Quirky and Forgotten Side of Technology: Is CRT The Best Display For Retro Gaming? Recently I had an old school friend come and visit me for a weekend. After a night visiting a few of my local sleazy night spots, we returned back to my place and decided to revisit our youth and play some of the games we used to love when we were kids. I've still got a big collection of classic systems, but my friend hadn't played some of them since our school days back in the 90s. His first impression was how dated the graphics looked, sadly I tended to agree with him, but there was something different... I was playing my systems on a modern LCD flatpanel TV. 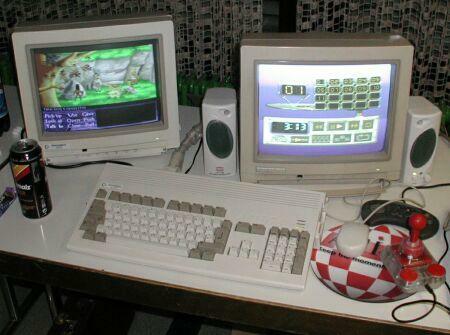 Any purist gamer will tell you that CRT displays are the way to enjoy older systems, after all they were designed with these displays in mind. Why go to all the effort of maintaining vintage hardware for "the true experience" when you're not going to go the whole way and get a suitable display? After setting up my old CRT display I was blown away by how good the games looked again, they looked every bit as good as I remembered them!